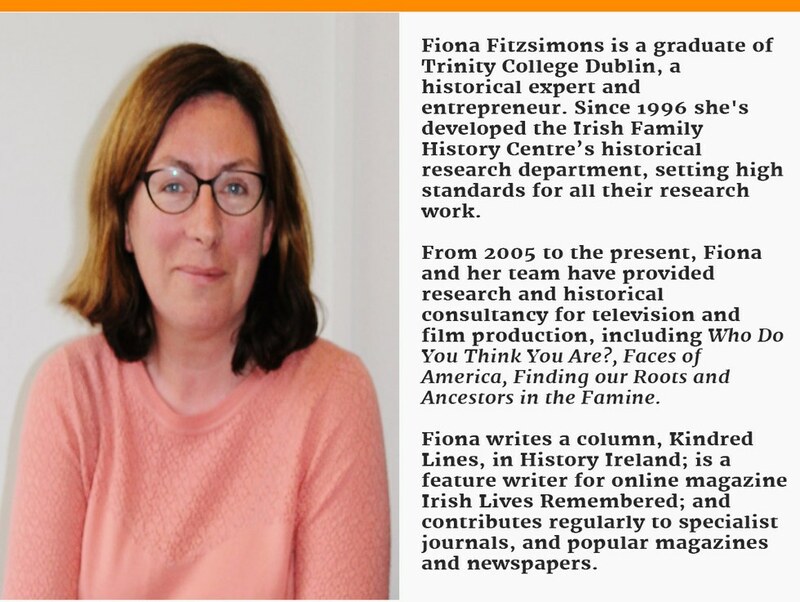 Fiona Fitzsimons of the Irish Family History Centre explains everything you need to know as you set out on your Irish genealogy journey. In the last decade, genealogy has become one of the fastest-growing pasttimes in the world. How can we explain this change in such a short time? The interest in family history is driven first and foremost by better access to the records, many of which are now published online. The success of T.V. programmes like Who Do You Think You Are? is also a factor, as it shows that every family has its' own narrative. The best way to learn anything is by doing it, and not to be afraid of making mistakes as you go along. 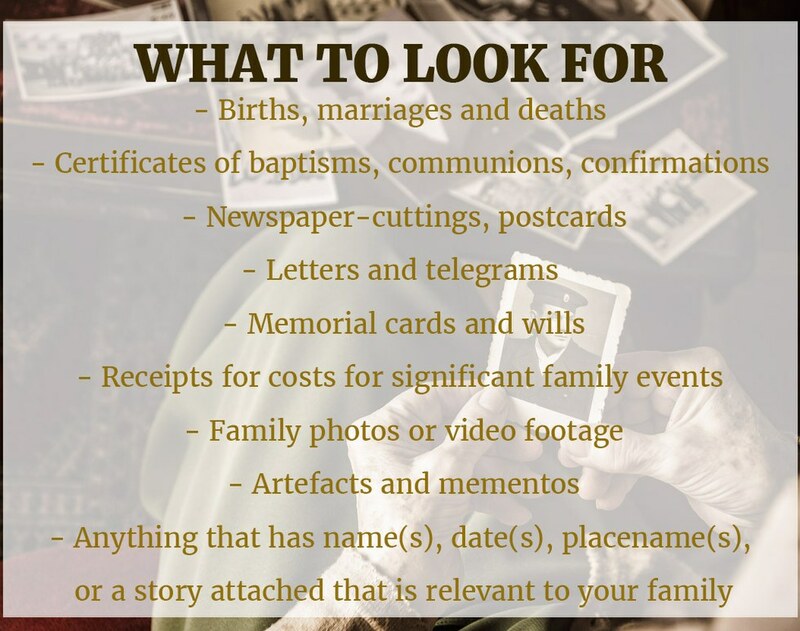 Here are ten things you should know/do before you start to research your family history. In family history, personal observation is key. Your own siblings, parents, cousins, aunts and uncles, or grandparents, if they are still alive, are living sources. So start asking questions! Do they remember visits, letters, or even stories of relatives that had left Ireland, but remained in touch with the family at home? You can sometimes prompt memories by asking an older relative about the family's experience in key historical events. Did they or any family member participate in either World War for example? Were they or any family member active during the Irish War of Independence and or Civil War? 1. Do use old photographs to try and prompt the memory of the person that you're talking to and don't be shy of taking notes during the conversation, or with their permission you might even decide to tape them. 2. Do ask where the bodies are buried, and then follow up your interview with a visit to the graveyard(s) to see if you can find a burial record or headstone. Almost every family has someone who keeps old family records, documents and photo albums. Where other family members have thrown out the clutter from their houses, these magpies have gathered up every keepsake and family document they could lay their hands on. Having spent years compiling this information, don't expect them to just hand everything over. They are usually quite happy to sit and discuss your shared family history, and to let you look through what documents they have. 3. Do bring a pencil and paper to copy any records relevant to your search and ask if they're willing to let you copy old documents, but don't take offence if they say no. 4. If they say yes, taking a photograph will inflict the least damage on an old document. Photocopiers can damage old documents, and a copy (transcript) of the original document will usually do for research. 5. Do take a copy of any family tree that the family archivist may have prepared, but don't forget to check it after for potential errors. Irish society is very informal, and people often used the Irish version of their names for everyday use, and the English version for official use. 6. Check did your family use their actual names as they appear on baptismal or birth records, or did they use informal Irish versions or diminutives of their names. E.g. Seán or Séan (Shane) for John; Dermot for Jeremiah; Peg for Margaret; Delia for Bridget. 7. Record the dates, places and any stories of births, marriages, deaths and any other key events in your family. Don't forget to make a note of your source, whether it's a family story told by your uncle, or a legal document – a will or civil birth record. Keep track of what records you use during research, and the timeframe searched. E.g. civil births 1871 -1881/ burial records 1820-30. This is important whether you're researching online or in an archive. 8. A family tree is a good visual aid. As you branch-out on your maternal and paternal lines, draw a simple family tree, that places each generation parallel, on the same level. So, for example, your paternal grandparents' should be parallel with your maternal grandparents. It's a simple visual aid that can help you avoid one of the most common errors. 9. Searching online. An index is not a record. Always look at the original record, and only believe what you see with your own eyes. Findmypast and other subscription sites usually link their index to digital images of the original documents. 10. Take your time. When researching your family history, don't lose sight of the fact that you're dealing with real peoples' lives, and always keep an open mind about what you discover. Give yourself time for information to sink in.You may find that your ancestors are as full of inconsistencies and contradictions as anyone alive in your family today.